To satisfy my curiosity, I just tried a quick run for pgbench with UNLOGGED tables. 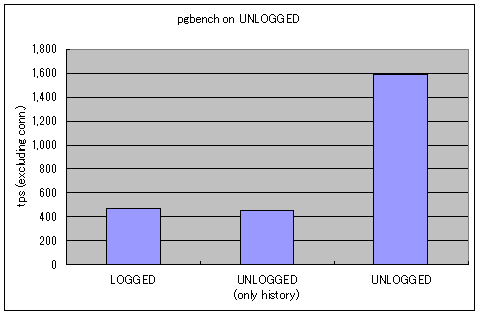 Under the pgbench transaction model, a kind of tpc-b, changing the history table attribute to "UNLOGGED" did not contribute to the performance. 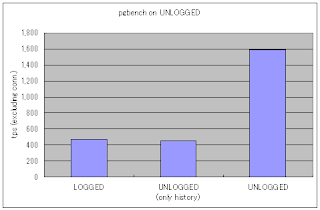 The results shown in the right image are averages of running pgbench 10 times each. Create `testdb' to run a regular pgbench. Dump schemas with `pg_dump --schema-only testdb' into a schema file. Dump data with `pg_dump --data-only testdb' into a data file. Edit the schema file, by hands, to create the UNLOGGED table(s). Import the schemas with using the schema file into `testdb_nologged'. Import the data with using the data file into `testdb_nologged'. Run pgbench against `testdb' and 'testdb_nologged'. How does that compare with settting fsync=off or synchronous_commit=off? That seems a good point. I'm interested in it, too. So I will test and post it in a few days. Thanks for the comment. Just posted the updated one.